The Philadelphia Eagles were 1-0 as they faced the Washington Redskins, rivals in the NFC East, on September 17, 1989. Entering their fourth season under brash Head Coach Buddy Ryan, the Eagles had surged in the second half of the ’88 season to a 10-6 record and the NFC East title for their first postseason appearance in seven years. 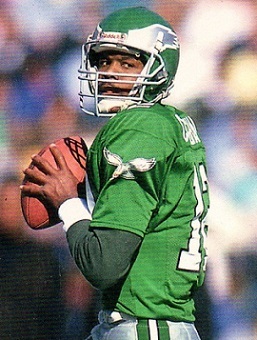 Central to the offense was QB Randall Cunningham (pictured above), who passed for 3808 yards and ran for 624. Beyond the fleet-footed quarterback, the running game was ordinary, with RB Keith Byars proving to be more effective as a receiver out of the backfield than a runner from scrimmage. The attacking defense was led by DE Reggie White and, while prone to giving up big plays on passes, improvement was anticipated. The Eagles defeated Seattle with ease in the first week. Washington was coached by Joe Gibbs, who had enjoyed much success since taking over the team in 1981 but was coming off of a disappointing 7-9 record in 1988. QB Mark Rypien was taking over for the hobbled Doug Williams and it was hoped that the running game would improve with the addition of RB Gerald Riggs from the Falcons. It was also anticipated that the defense would recover from an injury-riddled year. The Redskins suffered a tough opening loss against the Giants the previous Monday night. There were 53,493 fans in attendance at RFK Stadium. The Redskins struck quickly when, on their first play from scrimmage, Mark Rypien threw to WR Gary Clark for an 80-yard touchdown. The extra point attempt was aborted due to a bad snap but Washington held the early 6-0 advantage. That lead got larger when DE Charles Mann recovered a fumble by FB Anthony Toney at the Philadelphia 41 and, on the next play, Gerald Riggs broke away for another TD. This time Chip Lohmiller added the point after and, having run just two offensive plays, the Redskins were up by 13-0. It got worse for the Eagles when a Randall Cunningham pass was intercepted by CB Brian Davis, who returned it 13 yards to the Philadelphia 12. Two plays later, Rypien tossed a scoring throw to RB Earnest Byner from 11 yards out and, following another Lohmiller conversion, the home team was ahead by 20-0. The Eagles responded with a nine-play, 80-yard series that included an unsportsmanlike conduct penalty on the defense and a pass from Cunningham to Keith Byars that picked up 28 yards. Cunningham connected with TE Keith Jackson for a 17-yard touchdown and, following the extra point by Luis Zendejas, the score stood at 20-7 after an eventful first quarter of play. As the game headed into the second quarter, the Redskins came back with an 80-yard possession in eight plays. Riggs (pictured below) carried for a 46-yard gain and Rypien threw to Clark for 21 yards before the series ended with another Rypien-to-Clark TD, this time covering five yards. Lohmiller’s conversion put Washington ahead by a formidable 27-7. The Eagles got a break on defense when DB William Frizzell picked off a Rypien pass and returned it 23 yards to the Washington three. From there, Toney ran for a touchdown and, with Zendejas adding the PAT, Philadelphia was down by 13 points at 27-14. However, before the first half was over, the Redskins put together a long drive of 63 yards in 12 plays. Rypien completed a pass to WR Art Monk for 17 yards and two to WR Ricky Sanders for 13 and 14 yards to set up a 25-yard Lohmiller field goal. Washington took a 30-14 lead into halftime. The third quarter was relatively quiet, with the Eagles mounting a 92-yard drive in 12 plays for the only score. Cunningham connected with Byars for 31 yards, WR Mike Quick for 21, and Byars again for 12 along the way before tossing a touchdown pass to Jackson that covered five yards. Zendejas converted and it was a 30-21 game heading into the final period. Philadelphia narrowed the margin even further in the early minutes of the fourth quarter after SS Andre Waters recovered a Rypien fumble and returned it 16 yards. In a drive that covered 42 yards in seven plays, Cunningham passed to Byars for 20 yards and connected with WR Cris Carter for a five-yard TD. Zendejas booted the extra point and suddenly the Eagles were only two points down at 30-28. The visitors regained possession on a fumble and appeared primed to take the lead, but Zendejas missed on a 33-yard field goal attempt. Having gained a reprieve, and following an exchange of punts, the Redskins finally got on the board again following a six-play, 71-yard series that concluded with Rypien going long to Monk for a 43-yard touchdown. Lohmiller added the point after that put Washington ahead by a seemingly comfortable 37-28 with 3:06 remaining on the clock. Philadelphia responded with a drive that covered 69 yards in eight plays. Cunningham completed five straight passes that included one to Jackson for 17 yards and two to WR Gregg Garrity that covered 29 and 12 yards. Finally, it was Cunningham to Quick, who made a leaping grab for a two-yard TD and, with Zendejas adding the extra point, the Eagles were down by just 37-35. It looked as though the two-point margin would hold for the Redskins, however, as Riggs took off for a 58-yard gain on first down to the Philadelphia 22. But two plays later, and with 1:16 left on the clock, LB Al Harris recovered a Riggs fumble and, before he could be pulled down by OT Jim Lachey, he handed off to FS Wes Hopkins who proceeded to charge 77 yards down the sideline to the Washington four (While Coach Gibbs complained that the Hopkins runback was due to a forward lateral, the replay official indicated that it was inconclusive). On the next play, Cunningham threw to Jackson (pictured below), who was open in the end zone for a touchdown and Zendejas tacked on the point after. 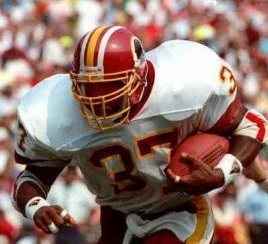 Any remaining chance for the Redskins ended when Rypien fumbled while being sacked by DT Jerome Brown and Reggie White recovered at the Washington 15 with 43 seconds to go. The Eagles, trailing for almost the entire game and twice by as many as 20 points, came away winners by a final score of 42-37. The Redskins had the edge in total yards (492 to 474) although Philadelphia had far more first downs (32 to 16). Washington turned the ball over a critical six times, to three by the Eagles. The Redskins recorded four sacks to two by Philadelphia. Randall Cunningham, who just received a five-year contract extension, had a huge performance as he completed 34 of 46 passes for 447 yards (breaking a team record that had been set in 1953) with five touchdowns while giving up one interception. Keith Jackson had 12 catches for 126 yards and three TDs and Keith Byars gained 130 yards on his 8 pass receptions. Anthony Toney rushed for 24 yards on 9 attempts that included a score. On defense, Jerome Brown had a notable performance with nine tackles and two sacks. For the Redskins, Gerald Riggs gained a club-record 221 yards on 29 rushing attempts with one touchdown, but the outstanding performance was tarnished by the late fumble. Mark Rypien was successful on 12 of 23 throws for 288 yards and four TDs while being picked off twice. Gary Clark caught four passes for 153 yards and two touchdowns and Art Monk also had four receptions, for 87 yards and a TD. The Eagles, who were 2-0 for the first time since 1981, lost their next two games but reeled off four straight wins before briefly slumping. They lost the rematch with the Redskins at home in a far more low-scoring contest (10-3) and went on to place second in the NFC East with an 11-5 record, securing a playoff spot and losing to the Rams in the Wild Card round. Washington recovered to win three of its next four games and, after slumping to 5-6, finished the season with five consecutive victories to end up third in the division at 10-6, although out of the playoffs. The fortunes of the game’s major statistical performers varied over the course of the season. Randall Cunningham passed for 3400 yards and 21 touchdowns, with 15 interceptions, and again led the club in rushing with 621 yards. While he was chosen to the Pro Bowl for a second straight year, his performance was uneven as injuries to receivers, in particular Mike Quick and Keith Jackson, took their toll. Jackson still managed to gain selection to the Pro Bowl as well, although his numbers were reduced to 63 catches for 648 yards (10.3 avg.) and the three touchdowns scored against Washington were his total for the year. Gerald Riggs also failed to sustain a strong start, not reaching the hundred-yard mark in the remainder of an injury-plagued season (although he did gain 99 yards in Week 7 against Tampa Bay). He finished with 834 yards on 201 carries (4.1 avg.) with four TDs.